Many years ago, I noticed that as our family grew, so did the amount of trash in our trash can. In my search to reduce, reuse and recycle, I began composting our food scraps and yard waste resulting in a significant reduction in our weekly volume of garbage. Our food scraps and yard waste go into the compost bin and a few months later come out as lovely sweet-smelling compost. We feed our compost to our vegetable garden, grow healthier and tastier vegetables, and then the process begins again. 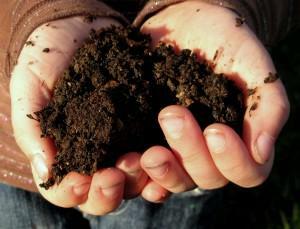 Composting is the decomposition of organic matter that happens continuously in nature– it’s nature’s way to recycle. Microorganisms like bacteria and fungi use the carbon and nitrogen found in organic materials and break them down producing dark, rich, organic soil. Composting creates healthy nutrient-rich soil for your yard plants or vegetable garden. Healthy soil produces healthy disease-resistant plants eliminating the need for pesticides and fungicides. Composting saves you money. Your home-made compost replaces the chemical fertilizers and soil amendments you would normally purchase to build your soil. Composting is good for the environment. Composting recycles your organic waste and reduces solid waste and the pollution caused by transporting it to the landfill. 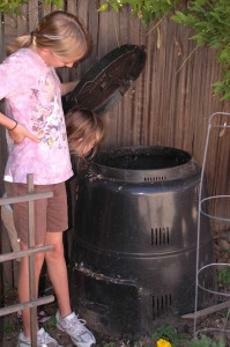 Composting conserves water. Healthier soil holds more water thereby reducing water requirements – and your water bill. Find a space: Composting doesn’t have to be fancy. A 3-foot square space in a partially shady spot in your yard is sufficient. Even apartment residents can compost with vermicomposting – basically a box full of worms! Build a bin: Keeping your compost in a bin will keep it neat, and deter nighttime visitors such as rodents and raccoons from visiting. Homemade bins: Bins can be constructed from wood pallets, wire mesh, or other scraps and should be at least 3 feet wide by 3 feet deep by 3 feet tall. Buy a bin: Composting bins can be purchased at your local garden center or online and come in many styles from turning units and cone-shaped bins to stacking tiers. We bought dome compost bin for under $40.00 many years ago at a special event hosted by the City of San Diego Environmental Services Department. We have it in the corner of the yard in case it gets a bit smelly in the summer, right next to our vegetable garden for convenient unloading. Greens: Fruit and vegetable scraps, grass clippings, green leaves, yard trimmings, coffee grounds, egg shells. Browns: Dead leaves, dried grass, fireplace ashes, tea bags. Water: Keep your compost pile moist, but not too moist. Air: Turn your compost pile with a pitchfork or turning fork at least once each week. It will compost quicker and keep it from smelling bad. Toxic materials such as charcoal, Duraflame ashes, or treated wood. Compost can be ready as soon as 12 weeks, but ideally six months produces lovely dark brown crumbly nutrient-rich soil ready to be mixed into the soil of your yard or vegetable garden. When we pull ours out of the bottom of our bin, we pick out the bits that didn’t decompose and put them back in to the bin and then use the rest for our vegetable garden. Composting is good for the environment, good for your plants, and easy to do. Start composting today! The Sierra Club has an informative and easy-to-follow video on how to compost. The City of San Diego’s Environmental Services Department provides a complete Guide to Backyard Composting. City of San Diego Rotline (760) 436-7986. The Solana Center offers garden tours and free composting workshops. http://www.solanacenter.org/.